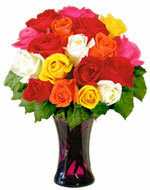 Water to which a good floral preservative has been added is the best solution in which to arrange fresh cut roses. Using it as recommended will provide additional days of vase life. Avoid using water from a water softener. Water to which a good floral preservative has been added is the best solution in which to arrange fresh cut lilies. Using it as recommended will provide additional days of vase life. Avoid using water from a water softener. 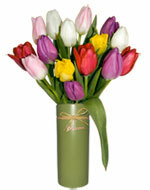 Water to which a good floral preservative has been added is the best solution in which to arrange fresh cut tulips. Using it as recommended will provide additional days of vase life. Avoid using water from a water softener. 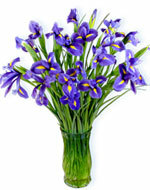 Water to which a good floral preservative has been added is the best solution in which to arrange fresh cut iris. Using it as recommended will provide additional days of vase life. Avoid using water from a water softener. 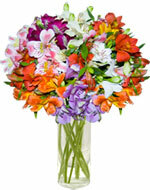 Water to which a good floral preservative has been added is the best solution in which to arrange fresh cut alstroemeria. Using it as recommended will provide additional days of vase life. Avoid using water from a water softener. Water to which a good floral preservative has been added is the best solution in which to arrange fresh cut daisies. Using it as recommended will provide additional days of vase life. Avoid using water from a water softener.